On my xmas route, our stay in Prague was lovely but who expects me to sleep with friends who know how to get you talking and laughing all night plus the excitement of the Czech capital during the xmas season..? You do the thinking. 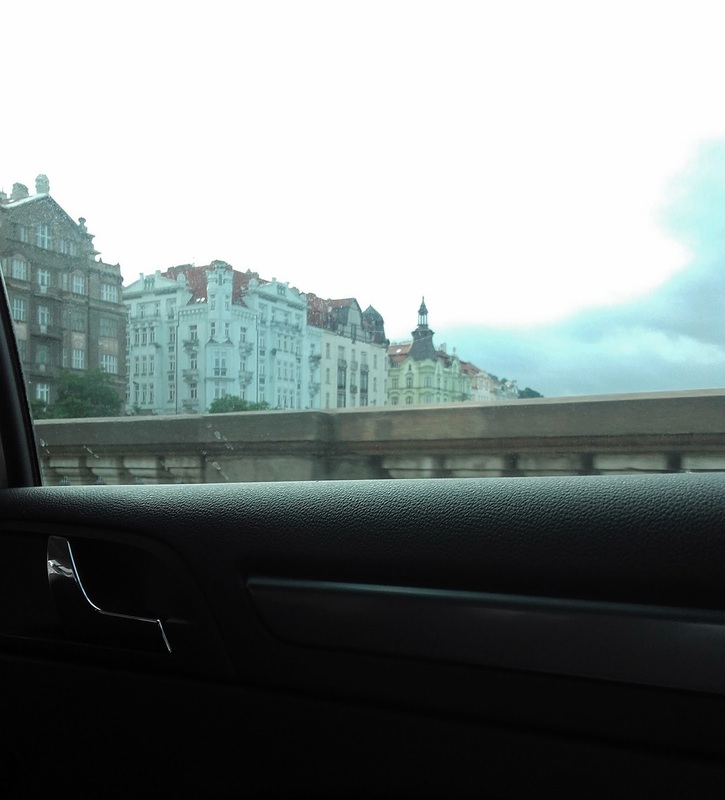 Super tired and lying on the bed while writing this, I spent all day in Prague but did not go to see the typical things. Instead I had to finish some things I left unseen on the previous visits. Expecting to be super productive but ending up leaving the house around 12 (lazylau) I could only see the Jewish Quarter with the synagogues and after lunch went to visit the Klementinum. So there are still things I have to see (Kafka Museum and Strahov monastery). Monday night was kinda crazy but fun. I arrived home super tired and zombie-like but a shower and my PJS and another round of makeup did some work on that. Then Michal suggested going to have a drink in a nice park -Riegrovy Sadi - and it was lovely since I discovered a nice place where you get a gorgeous view of the city at your feet. After 3 cocktails and some wine and lau talking too much in every possible way (fb messages, whatsapp and in person) the night took an interesting turn but around 2-3pm I decided to call it a night before it all lingering until it was day -if you know. OK last night I started this post but something (read sb) came up and it turned (again) to be an interesting evening-night-morning [no juicy details incl.] Although I was super tired from visiting things all day I guess the thousands of coffees made an effect someway. Michal helped me booking the tickets to go to Cesky Krumlov and today I got on a 3h bus to see the small village which is UNESCO World Heritage Site. I guess I was expecting more or I am just too in love with Prague (which makes me wonder now should I spend tomorrow visiting the Kafka museum or just I just wander around enjoying and trying to accept that I am leaving at night? -& I am already thinking about coming back, I mean.. Bday tradition is lau's bday tradition...). The guided tour around Cesky Krumlov lasted 2 hours and was quite interesting and the guide was super nice and friendly. I got to know other travelers from around the world & some of them were just discovering places in Europe so I got super jealous -another reason why I don't want to come back home tomorrow. After the tour I didn't know what to do since the town is super small and I was only left with the option of visiting museums (if i had any luck finding them) because rain appeared to make a long stay in Krumlov. A guy from NY I met on the tour went with me for a walk around the center and we went to have a coffee and some cake since the weather was being a b*ch... But I had no luck waiting for it to stop so when I had to go to the bus station in no other way than my foot the rain decided to hit on even stronger (great day trip ending). I still consider myself lucky I didn't catch a cold. I was super cold in the bus and thought I could get some rest there but I was super awake and had several Friends episodes available so at least I got some entertainment... When I got to Prague of course it started raining again and the air in the metro stations made me feel like i was inside an igloo. My walk from the metro to the apartment was of course depressing since it was already dark (&late) and I looked like i had been swimming with my clothes on... Took some sushi to take away with the idea to eat it at home, only to my (expected) disappointment sth took all my hunger away. Lucky me my bestie might have a radar for when i'm in need of a girl talk and she just wrote me a message so I called her instantly. Idk why we laugh so much with simple things and we don't like to share some seins stuff but we (read mostly i) end up doing so. I told her all the Czech-related gossip briefly because of course i took more time to pride myself on certain things and try to convince her (and me for the thousand time) of how great it all actually was and the accomplishment I made etc etc. Anything to keep my mind distracted from other things (as if Prague itself wasn't enough... but it seems i'm jumping from spiderweb to spiderweb). Due to past experiences and lack of trust or due to my usual paranoia and superlack of trust + analyzing every single word and tone, here I am still wondering about it all and figuring out a way to get out of this like the fab lady i am (*can be sometimes*). To make sure I am I booked a -possibly very nice- taxi for tomorrow the second we ended our call. Unlady like (more like a guy) I got all excited to see the car could be one of my favs -Audi a5- though there were others like WG Passat, Skoda Superb, Audi a6 etc. Please please make my Czech parting be a stylish one with the a5 I am constantly dreaming of! Back to my midnight thoughts I would love for it to be all in my head but part of me is still waiting to hear or be told sth so I am not left with a doubt knowing it would lead to me feeling worse (mou if you are reading this is about today's call issues, not jjjothers). uhmm I guess I should follow the motto ignorance is bliss and fake it until i make it, or my mind considers it high time to erase it from my night thoughts. They are demons, really. How can I get to be so successful but only focus on one single detail to throw my day away? Born a scorpio never did a good thing on my nighty mind. This tendency to analyze and make theories up is quite destroying and will make me regret everything tomorrow morning when waking up with a headache.